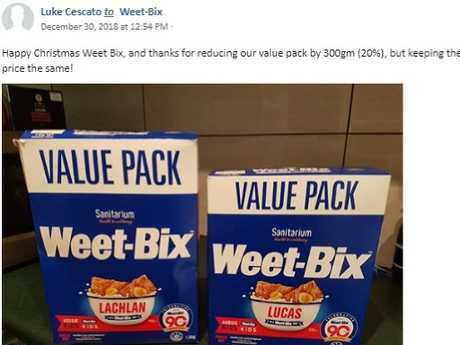 A WEET-Bix size switch has left shoppers paying the same for less product. 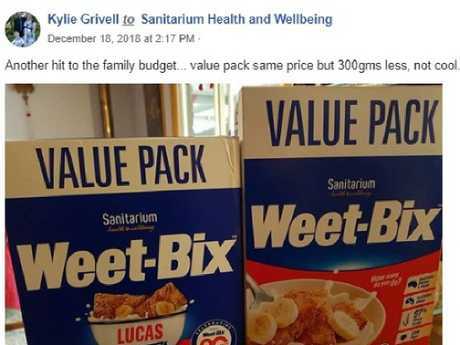 Bargain 1.5kg boxes of Sanitarium's breakfast cereal favourite at Coles supermarkets were recently replaced with its "more popular" 1.2kg pack. Some angry buyers have lashed out at being charged just as much for 20 per cent less. Sanitarium said the drought and other pressures had bumped up manufacturing costs. The cost of Weet-Bix at Woolworths has also risen, the Herald Sun has confirmed. Coles exclusively sold the now deleted 1.5kg value pack for $5. 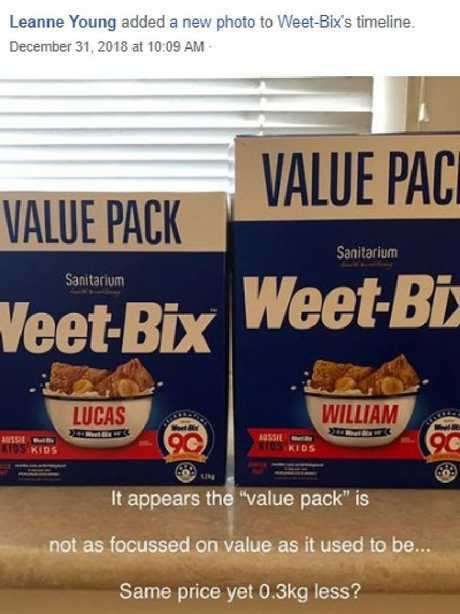 The 1.2kg value pack is $5, and has 12 fewer Weet-Bix. At Woolies the 1.2kg box is now $5. That's up from $4 - a 25 per cent price jump. A Woolworths spokesman said it had "reluctantly moved the shelf price" as a result of Sanitarium's recent cost increase. Responding to unhappy customers on social media, Sanitarium has blamed rising costs for "an adjustment in pricing" and "realigning our value pack offering". "In the past four years our costs for wheat, energy, packaging and transport have all increased," it said. 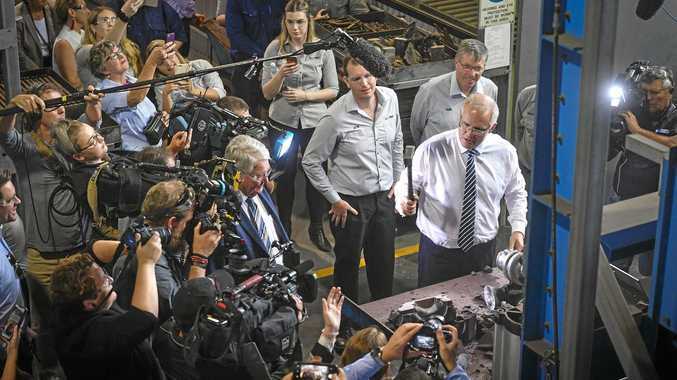 In a statement to the Herald Sun it said: "Rising input cost pressures such as energy and transport have been impacting the Australian manufacturing sector for some time. The drought exacerbated these pressures, particularly in relation to wheat prices". Some consumers have complained about getting less value for money. 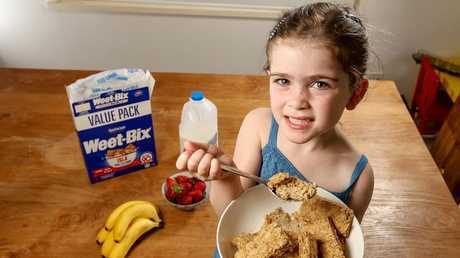 "You're stiffing us a whole row of Weet-Bix," one wrote on Facebook. Another commented: "Another hit to the family budget … value pack same price but 300g less, not cool." Others said the brand was still affordable, and vowed to keep eating it. "Cheaper and better for you than a lot of other cereals. I'll still be eating them each morning," a supporter pledged. 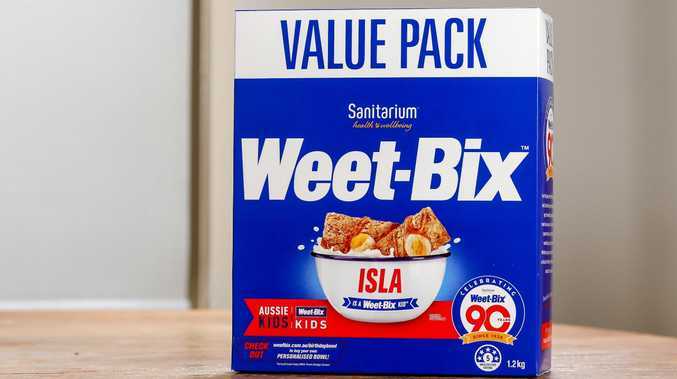 Sanitarium said: "The current on-shelf pricing for the 1.2kg Weet-Bix pack in both major retailers brings the cost per serve (two Weet-Bix) to just 14c - still representing the best value wholegrain nutrition in the breakfast aisle." Wyndham Vale man Jim Rouse, who has had Weet-Bix for breakfast for decades, tipped off the Herald Sun to changes. "It used to be a much better deal but I will still eat the stuff anyway," Mr Rouse, 74, said.